When I first saw pics of this piece online, I was a little nervous about ordering it. The pictures made it seem pretty decent, but I have never bought an HCG item before and I know that final product can sometimes differ drastically from a company's solicitation photography. 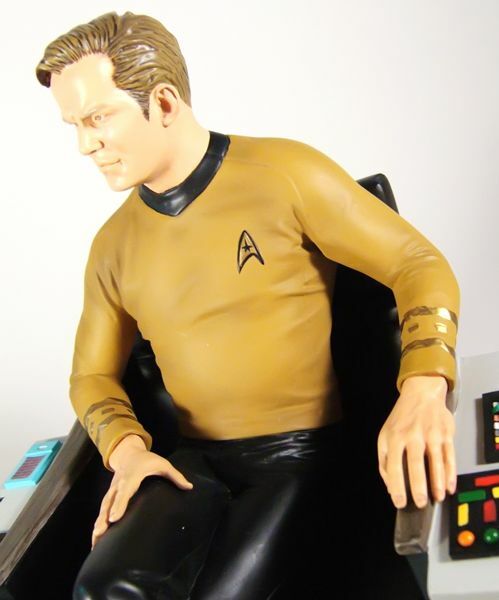 In the case of Kirk, I'm happy to say that the final product exceeds my initial expectations. Let's start with the size- This guy is BIG! 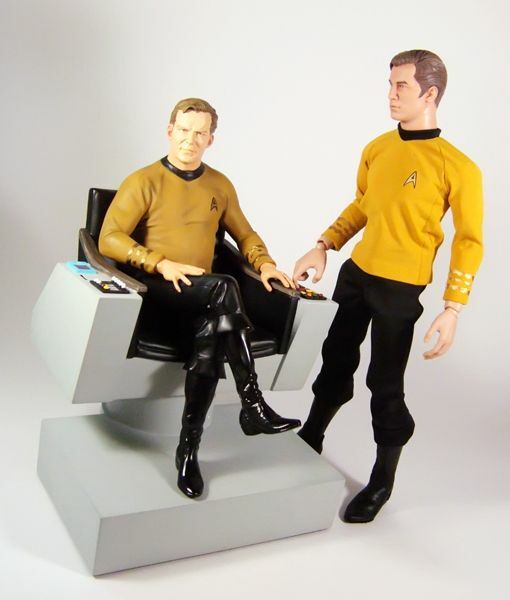 Kirk is made at a roughly 1/6th scale, making the statue about 10" tall (since Kirk is in a sitting position). I don't have a scale handy, but the statue has quite a bit of weight as well. 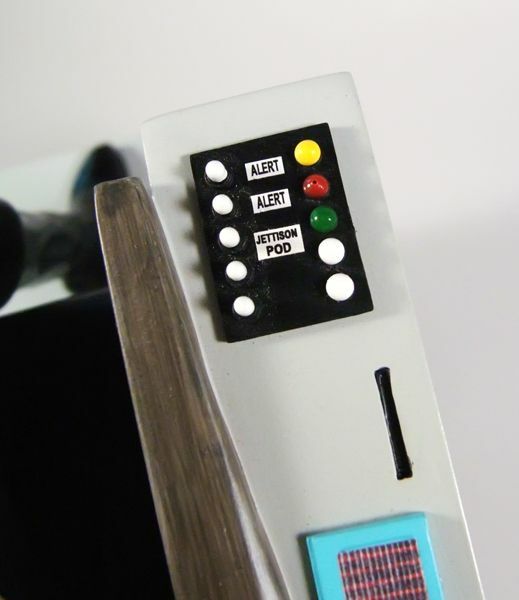 The overall size and heft really sets this apart as a true centerpiece for display. 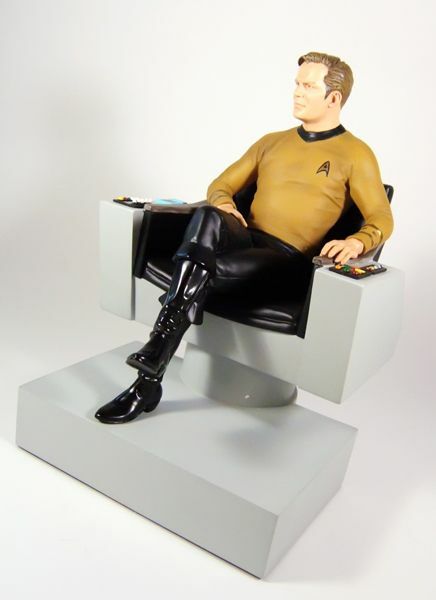 One small point I should point out here- Kirk is permanently affixed to his seat, so if you hoped to use the chair for your 12" figures (like I did), you're out of luck. 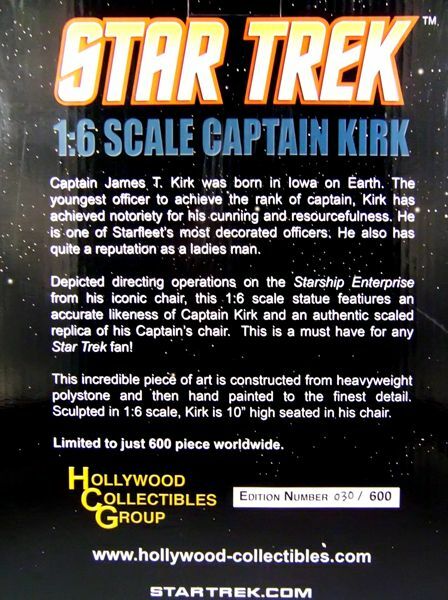 If there was one area that worried me above all others, it was how Kirk's head would turn out. 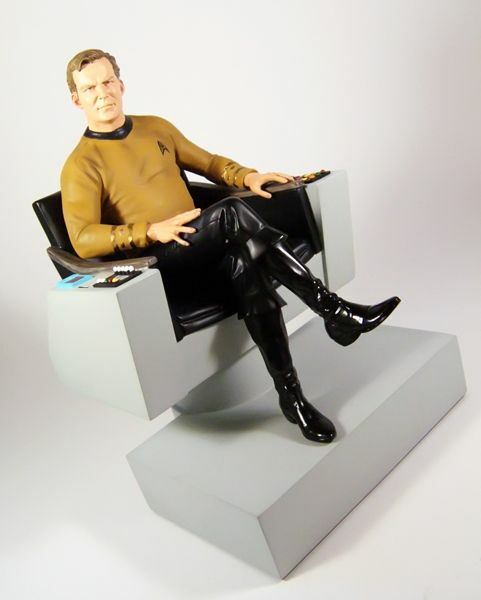 Shatner is one tough likeness to nail, and the initial HCG pictures didn't exactly fill me with confidence. The final product turned out much better than I thought it was going to. 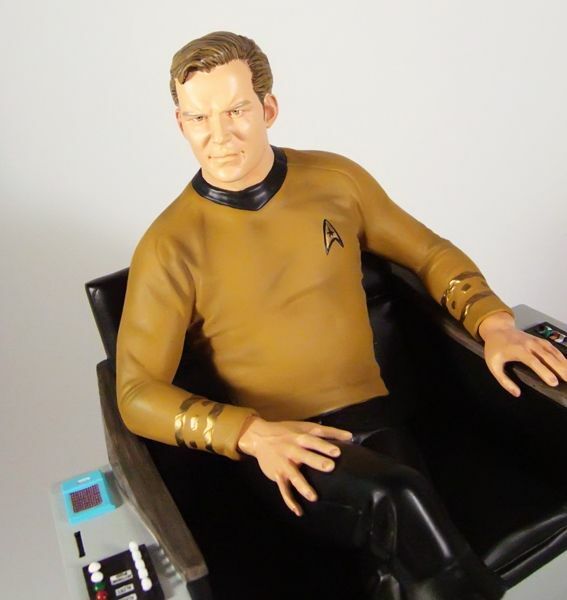 It's still not a perfect Kirk sculpt, but it's definitely better than a lot of the other product out there. 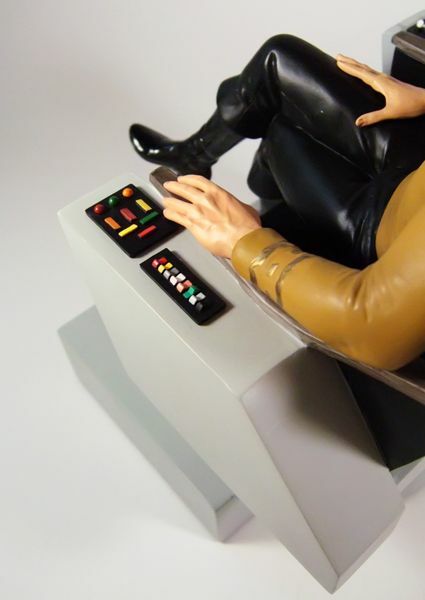 Go ahead and jettison that pod Kirk. Finney's a jerk. Nobody will miss him. ...feature a slightly glossier sheen than the pants, helping then contrast against each other. 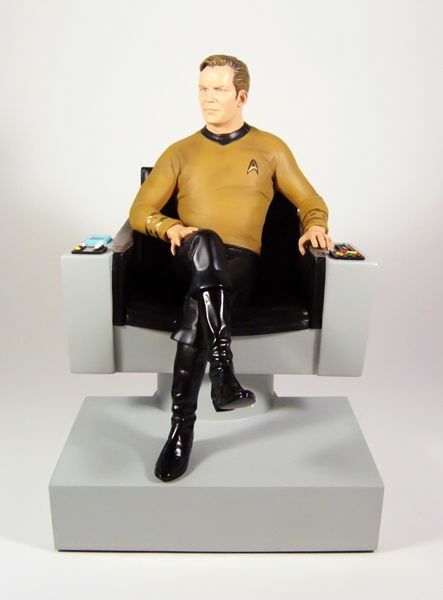 I know this is a pricey piece, but I have seen other statues in this same range that didn't feature anywhere near this quality of paint work. Kudos HCG! Printed on the bottom of each statue's base is the usual copyright info and the statue's individual number. HCG made 600 regular Kirks like the one I am reviewing, and 150 exclusive Kirks available through their site. 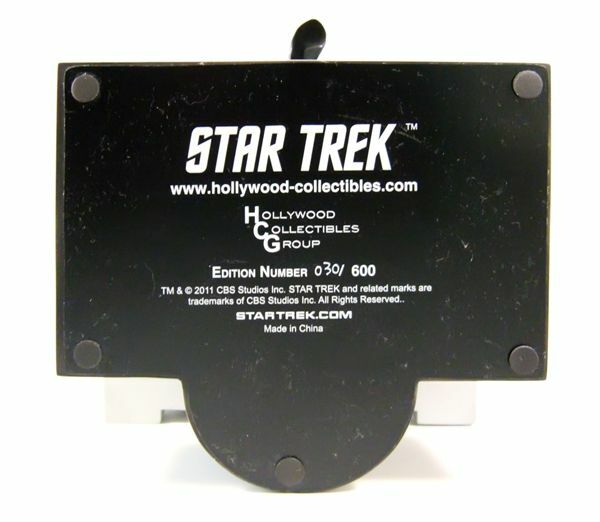 The exclusive version is basically the same as the regular edition, but also includes a "captain's log" and data cards. While I really wanted those extra pieces, I went with my comic shop as it saved me a few bucks in the long run. 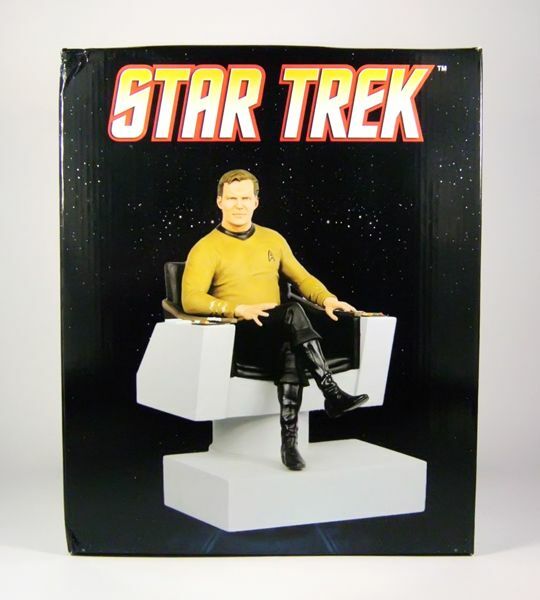 The body language of the pose is actually amazingly Shatner-esque, but you're right - the face just isn't quite there. Too much cro-magnon forehead, but I've definitely seen worse. Kirk looks almost crossed-eyed in his intensity, really angry. The kinda extreme expression hurts the facial features, I think... but overall it really is good. 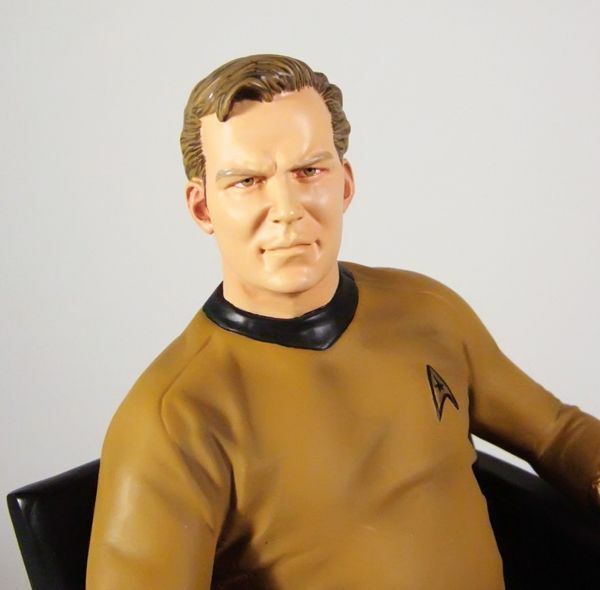 Now that I think about it, Kirk kind of looks like he's got a Charlie X making-somebody-go-away expression. They shouldn't have laughed at him. He told them not to laugh at him. I, too, am very pleased with the statue. I have one an Exclusive version (it was the same price as the Regular version so it really was a no-brainer which to pre-order). The first thing that struck me is the weight of this thing: it feels like it's carved out of solid stone! I agree that the likeness could have been better, but it is the best one to date. 1) The glossy clothes should have been a matte finish. Even the skin on the face should have been a little less glossy (maybe the Bridge air conditioning had malfunctioned!). 2) Kirk's hair looks too greenish. Maybe they were going for a blonde look, but in any case it really looks off. 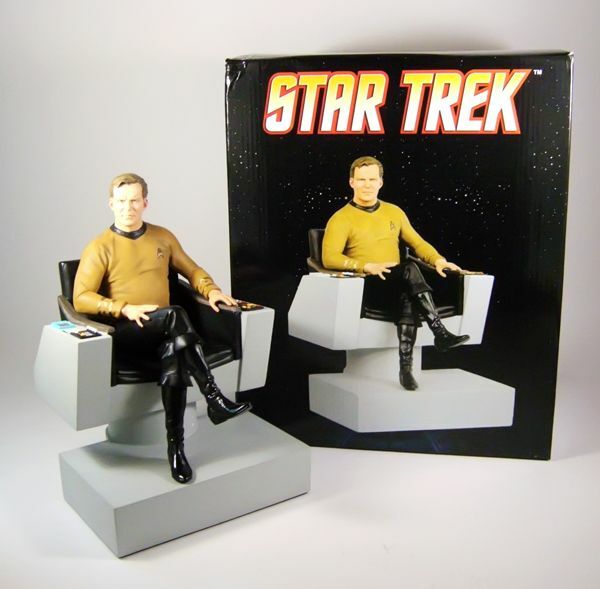 Other than those little finish details and the mediocre Kirk-likeness this is an exceptional piece! I do not regret my purchase. 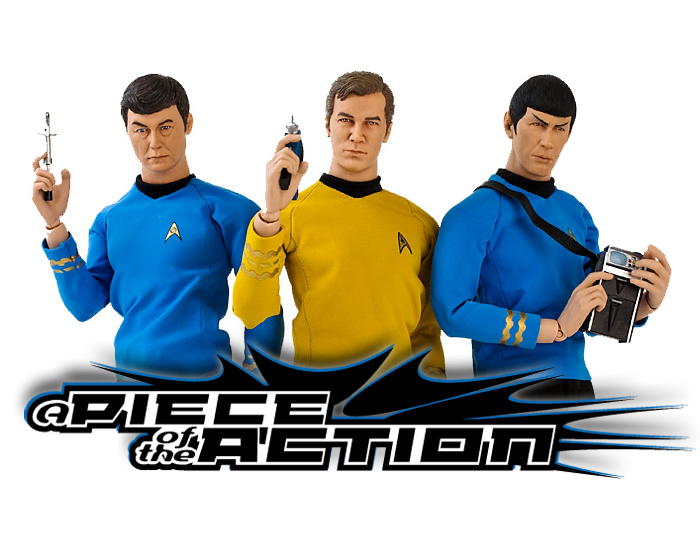 Now, onward "in search of Spock"?! I'm impressed with the photos. The detail is incredible even down to the folds in the shirt. Not sure if I'm ready to go down this financial commitment path just quite yet. My collection is modest and primarily consisting of items gifted to me by family and friends. 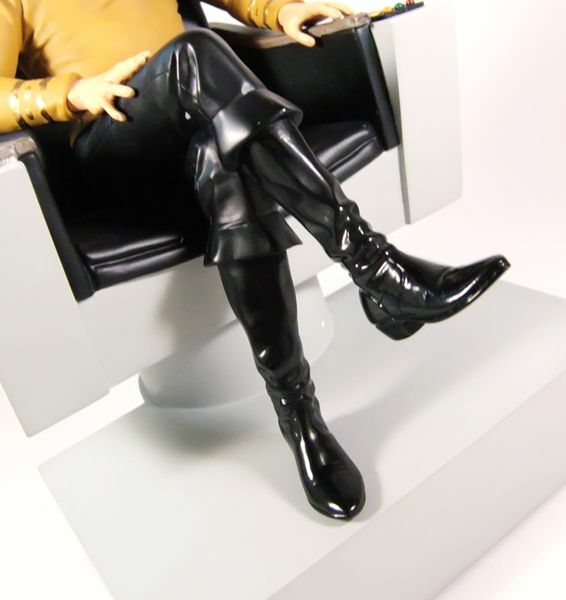 My library on the other hand has become quite extensive and it's because of my love of the literary side of Star Trek that I now want to concentrate on memorabilia. That's why blogs such as yours help me to become a better collector. As with any genre, if you're an avid collector you will spend good money for good products. Thanks for the review and I will give the statue some consideration now that I know it may be worth the price.